Street evangelism and your rights is a topic we get lots of emails about here at OAC. Many Christians are worried about sharing their faith particularly on the streets. The Evangelical Alliance responded to this concern and produced a very useful booklet outlining your rights and freedoms as a Christian. You can download or order a copy of “Speak Up” by clicking HERE. OAC also produced some guidelines on street evangelism and your rights in earlier blog post which you can see by clicking HERE. In short, you have lots of freedom to share your faith in work and on the streets. If you want to preach on the streets or sing praise songs you can, provided the area is public and not private property. There are some limitations regarding causing an obstruction, making too much noise or inciting religious hatred. However, common sense tells you if you are going too far. If you block a shop doorway, for instance, you are obviously going to upset the shopkeeper. The use of PA systems in often governed by local byelaws because no-one wants loud music or preaching blasting across the whole city. Being too loud is also counter productive. If you are preaching you want people to draw close to you and engage in what you’re saying. We run a series of training events throughout the year called “Streetwise.” The aim of these courses is to train people to be effective in street evangelism. Creativity, genteleness, humour and humility are attractive qualities and usually draw a crowd. You can check out the Streetwise training HERE. 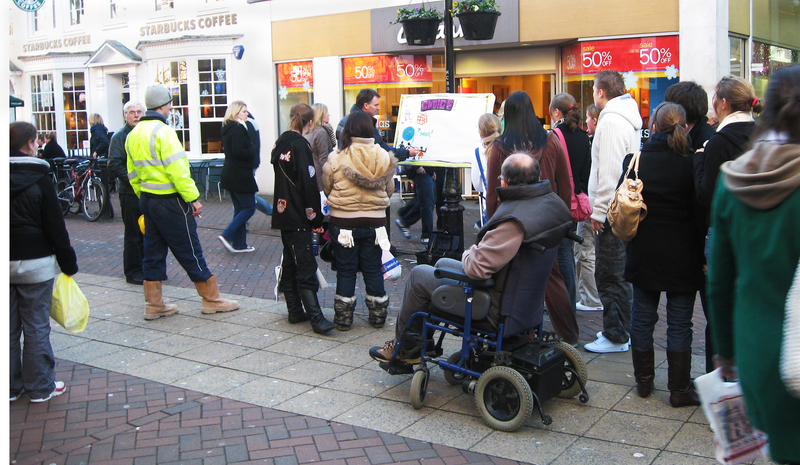 If you have more questions on street evangelism and your rights then please drop us an email. We are always happy to help if we can. HERE for a booklet by Christian Concern. HERE for a download from Christian Institute.